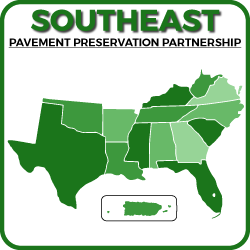 The Southeast Pavement Preservation Partnership (SEPPP) is comprised of representatives from regional state and local highway agencies, provincial transport agencies, industry, suppliers, consultants, and academia. Any interested agency, organization, company, or group may join and participate in the activities of this Partnership by contributing funds to the American Association of State Highway and Transportation Officials (AASHTO), or by paying fees to attend the annual workshop and conference. Managing the SEPPP’s operations, including an annual meeting, reporting, and developing and maintaining an informational web-site. Meetings, in addition to the annual workshop and task groups, also are possible. The proposed budget covers the cost of meeting arrangements, state travel, and a meeting report. Proceedings from the annual workshop and task group meetings will be documented in a report. The National Center for Pavement Preservation (NCPP) will prepare an annual report of the Partnership’s activities and events. The NCPP also will provide oversight and a web-site for the Partnership in cooperation with the Steering Committee and consistent with the Partnership’s By-laws.